Vassar’s Shakespeare garden, the second oldest in the United States, was the brainchild of President and Professor of English Henry Noble MacCracken. The garden opened on April 24 1916 in a ceremony commemorating the tercentenary anniversary of the Bard’s death with the planting of pansies and flower seeds from Shakespeare’s gardens in Stratford-on-Avon, England. Along with this help from Shakespeare’s estate, the garden was created and furnished by students, professors, and alumnae. 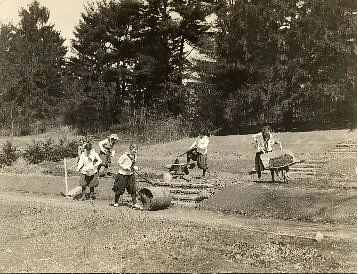 It was laid out on the site of the old botanical gardens overlooking the Fonteyn Kill creek by the 1915-1916 members of Miss Winifred Smith’s Shakespeare and Miss Emmeline Moore’s Botany classes. Miss Smith and her class also researched the contents of the gardens, formulating a list of all the plants that are mentioned in Shakespeare’s corpus. The fall following the garden’s opening, its caretakers sent out an invitation to alumnae in the November 1916 issue of the Vassar Quarterly, asking “Alumnae who have gardens...to contribute to the new Shakespare garden at the college, bulbs, roots, plants or seeds of the kinds herein below mentioned. They will confer a favor on those who have the garden in charge if they will communicate with Miss Emmeline Moore, Vassar College, before sending in their contributions....” A list two pages long of requested plants followed the announcement. 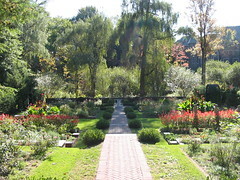 The garden has gone through several incarnations since 1916. It was re-designed in the 1920s, when Vassar was going through a period of campus-wide landscape remodeling. The garden was updated again in the 1977-78 school year, when Professor of Biology Lawrence N. Halfen and his botany class planted over 3,700 bulbs related to plants that Shakespeare mentioned. In the spring of 1978 Professor of English D. T. Mace attested that only plants appearing in Shakespeare’s works were included in the garden. The garden in its traditional site was threatened in the late 1980s, when it seemed that a new chemistry building might be built nearby in order to provide for maximum solar heating. When the site for Mudd Chemistry was moved to where the building now stands, the garden was remodeled a third time. The old flowerbeds were taken out and replaced by raised brick beds, which were subsequently endowed as memorials. The focus of the garden shifted as its collection expanded to include plants which were grown in England in the seventeeth century, not just those mentioned by Shakespeare. The original purpose of the garden was not forgotten, however: the renovation included two special beds created for the display of medicinal and culinary herbs, identified with tags bearing quotations from Shakespeare. Today, the Shakespeare garden is appreciated by all members of the Vassar community and visitors to the college as a place to relax and enjoy nature.